As the city’s mayor in the 1980s, he championed an unusual model of publicly supported housing. It’s still working. 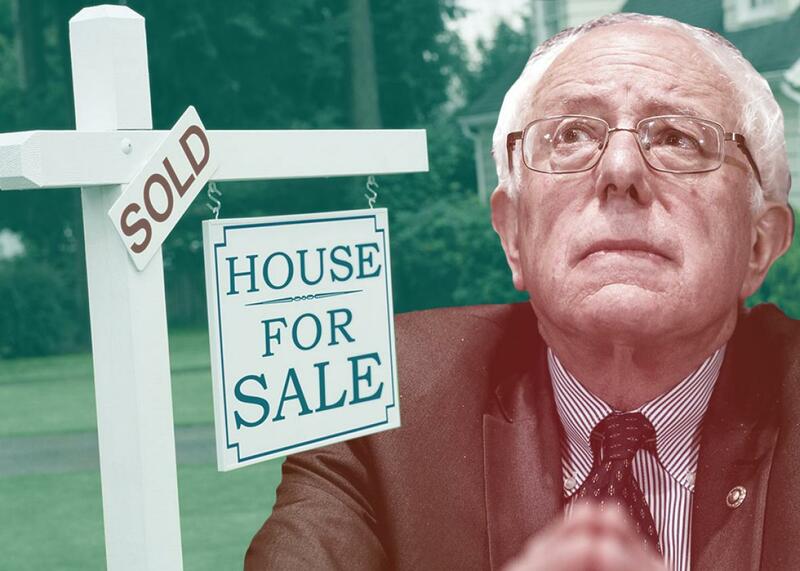 Some of Sanders’ housing policy ideas are still considered radical, but others have gained mainstream currency. Photo illustration by Slate. Photos by Alex Wong/Getty Images and Ryan McVay/Thinkstock. Bob Robbins bought his home in 1995 amid a bout of long-term unemployment. Living with his wife and two kids in a rundown rental in Burlington, Vermont, he wanted to stabilize the family’s housing before his children started kindergarten. Prospects seemed bleak. The family’s savings had dwindled after his unemployment insurance gave out. But in 1993 Robbins saw a newspaper advertisement for something called the Burlington Community Land Trust. He visited its offices and learned about its generous grants for low-income home ownership. The innovative offer would significantly lower the price by allowing the couple to purchase only the house, while the trust paid for the land it sat on. Within two years, his family owned a home in a small town just to the east of the city. The Robbins family bought its home through a conventional realtor and a commercial bank while also entering a covenant with the land trust to lease the land their home sits upon. This reduced the costs of their mortgage and down payment substantially. They’re far from alone. Across the land trust’s portfolio today, there are about 565 other homes that enjoy similar terms, not to mention 2,100 rental and cooperative units. Half of these holdings are located within the city of Burlington itself, which had a total of 16,897 housing units as of 2010, meaning that about 7.6 percent of the stock sits on the nonprofit’s land. The man largely responsible for this good fortune? Bernie Sanders. While mayor of Burlington in the 1980s, the democratic-socialist senator and current contender for the Democratic presidential nomination was an early champion of community land trusts. Today, the organization whose creation he made possible—now called the Champlain Housing Trust—is the largest and most influential of its type in the nation. Community land trusts are nonprofit organizations, with a board composed of representatives of the public, the local government, and the tenants, that obtain land and either develop it themselves or lease it to developers. The trust then removes its holdings from the private market, usually through 99-year ground leases and pre-emptive purchase requirements that limit how much the house can be sold for. Community land trust boosters argue that this not only ensures permanent affordability, but allows the organization to intercede in the case of, say, a foreclosure. An oft-cited study by the Lincoln Institute of Land Policy showed that, as of 2010, homeowners within a land trust were 10 times less likely to default on their homes than their private-market counterparts. The Champlain Housing Trust (which changed its name after a 2006 merger with an affordable rental development nonprofit) is inarguably the most successful land trust in America. Although many others worked to create the organization and expand it in subsequent decades, Sanders provided the seed money from Burlington’s municipal budget, political support, and sustained funding for a nonprofit model largely untested in the 1980s—and one that remains a niche model today. By the latest tally, the National Community Land Trust Network’s membership only covers 25,000 rental units, smaller than the number of traditional public housing apartments the Chicago Housing Authority controlled at its peak. There are also 13,000 home-ownership units protected by the trusts. The model is growing, helping tens of thousands of families across the country live in affordable units, but it’s still dwarfed by traditional public housing. Among community land trusts, no other organization has grown to the size of the Champlain Housing Trust. The second largest is Dudley Neighbors Inc., which only focuses on a segment of Boston’s Roxbury neighborhood, and controls 225 units of housing. Without the distinctly revolutionary attitude Sanders brought to local housing policy in Burlington, Robbins’ life would probably be very different today. When the idea was first presented to his administration and its allies in 1983, Sanders voiced serious reservations. Founding land trust board member Tim McKenzie says that the mayor feared the restrictions on reselling properties would create a form of second-class home ownership. If middle- and upper-class people could build wealth off their houses, why should the working class be limited to shared equity? Sanders’ preferred methods of ensuring housing affordability were rent control—which Burlington voters shot down in a referendum in 1982—and providing direct subsidies to low-income residents who wanted to buy homes. In 1984 the Sanders administration got the land trust started with a $200,000 seed grant and provided staff support from the municipal bureaucracy to shepherd the organization into existence. The city later made a significant loan from its pension fund, which was matched by the Burlington Savings Bank and bolstered with funds from U.S. Department of Housing and Urban Development programs to make initial home purchases affordable. To provide a more sustainable source of revenue, the Burlington Housing Trust Fund was created in 1988, bankrolled by a small increase in property taxes. But some incumbent homeowners and realtors in the North End, a working-class neighborhood at the center of the trust’s activity, pushed back. A group backed by real estate interests called Homeowners Against the Land Trust began picketing City Hall. They red-baited Sanders and other democratic-socialist officials, claiming they were seizing land and betraying sacrosanct property rights. When a developer offered to build 40 new homes on a vacant parcel in the North End and donate them to the trust, HALT showed up in force at Planning Commission hearings. The group retooled the lyrics to “Home on the Range” (“Give us a home/ on land that we own…”) and marched into public hearings singing loudly. The group’s heated protests eventually forced the developer to only give seven of the homes to the trust, even though all 40 were built. Nonetheless Sanders continued to champion innovative affordable housing concepts at the city level while also backing a state-level affordable housing trust fund that required its funds be spent on units with permanent affordability provisions. In Burlington this ensured that both state and municipal housing dollars would usually bolster the land trust’s stock. Today, Brenda Torpy, the land trust’s chief executive officer, estimates that about 15 percent of the city’s rental housing (including traditional public housing stock and other nonprofit holdings) has been removed from the market. The trust itself has expanded to include land in three counties. Some of Sanders’ housing policy ideas are still considered radical, at least in small cities (like the series of tenant protections he enacted), but others have gained mainstream currency. A favorite proposal, inclusionary zoning—which requires developments of a certain size to include a set percentage of affordable housing—was adopted by his democratic-socialist successor and is now a widely utilized tool in cities across the nation. The same can’t be said of community land trusts. But if the number of land trusts is growing—from 242 in 2011 to 280 today—it is hard to argue that they are yet a substantial part of the solution. No other organization has come anywhere close to the success enjoyed by the Champlain Housing Trust. In hot markets like Boston and Seattle, it is very difficult for fledgling nonprofits that lack municipal support or established funding mechanisms to obtain expensive land. The dozens of newly created community land trusts are more likely to emulate Boston’s Dudley Neighbors Inc., which focuses its activity in one neighborhood, or Seattle’s Homestead, which after 22 years has 191 units of housing scattered across the city. And those may be the best-case scenarios. There are also critics of community land trusts on the left who fear that in some contexts they may actually cut against housing affordability. When a land trust is focused on one geographically contained area, the community members on the board may well advocate for single-family homes with yards and open spaces, as they did in Dudley, and not for the quantity of new housing needed to satisfy demand. Burlington doesn’t have the superheated housing market of Boston, of course. But according to John Davis, who now helms a consulting firm focused on community land trust development, the Champlain Housing Trust actually catches flak from NIMBYs for building too densely. All of the projects currently underway are multiunit apartment or condo dwellings, which include a 40-unit co-op in the North End, a 20-unit apartment building in a growing suburban municipality, and 80 apartments on the Champlain lakefront. The land trust also recently purchased a couple motels the state was using to temporarily house homeless people, converting them into single-room occupancy apartments with wraparound services for the chronically homeless. Without Sanders’ support and advocacy, it’s unlikely there would be permanently affordable apartments being built on Lake Champlain. It is absolutely certain that the subsidies for affordable home ownership doled out in the 1980s, when HUD was far more generous than it is today, would have only helped the families that initially purchased the houses. Because of Sanders the house where Robbins lives will still be affordable to the next family in need.